White Dinner at Escola de Hotelaria e Turismo, Faro. 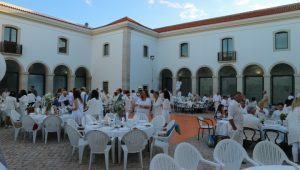 The 4th annual successful, White Night, Branco Ao Jantar, was organised by the Rotary Clubs of Estoi Palace International and Olhão together with the Alliance Française Algarve. 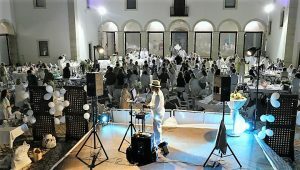 220 people attended the event held on Saturday 9th June, in the courtyard of the former 17th century convent that is now the Faro Catering College. Everybody attending dresses in white and brings their own food and dress up their own table. Ushi Kuhn from Rotary Club Almancil won the prize for the best decorated table. Guests were entertained during the evening by very talented young dancers from the Clube de Dancas João de Deus performing Agrentinian Tango. Our DJ for the evening was Vernon Delauney and he soon had everyone up dancing until late to his excellent music choices. From the entry donation a fantastic 4000 euros was raised which will benefit the Faro Banco Alimentar/Food Bank and Association Beleza dos Afetos who aim at helping children and young adults effect by autism.